Good Pitch Miami brings together eight hand-selected documentary film projects featuring Latin American and Hispanic stories to pitch their films before a forum designed to boost their social justice impact. The eight filmmaking teams will have the opportunity to forge new partnerships and collaborations with national and international foundations, NGOs, campaigners, philanthropists, policymakers, brands and media. Over 370 participants will be gathering at the New World Center from across the Americas, including organizations from Mexico, Brazil, Honduras, Colombia, Bolivia, New Zealand, Australia, India, Nigeria, UK, Netherlands and Canada. The event, taking place on June 20, was brought to life thanks to a collaboration with BRITDOC, the John S. and James L. Knight Foundation, Ford Foundation JustFilms initiative and Fusion Media Group (FMG) - a division of Univision Communications Inc.
“Supporting content that embodies the values of the new, rising American mainstream and highlights important, often untold, stories from the communities we serve is not only inspiring, it can change the world,” said Chad Boettcher, SVP of Social Impact at Univision Communications Inc. and Managing Director of Rise Up. “Good Pitch Miami turns a focus to the richness of stories from across Latin America, drawing together a room of uncommon diversity and power. 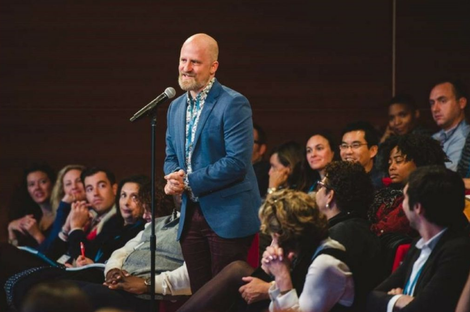 Connecting influencers and leaders to storytellers and issues, the filmmakers of Good Pitch show how documentary itself is a community act which can build a will to see greater justice across seemingly insurmountable divides. The experience of Good Pitch is ray of hope in a time of tumultuous change,” said Cara Mertes, head of JustFilms Initiative at the Ford Foundation. From a historic genocide trial to the overthrow of a President, “500 Years” tells a sweeping story of resistance in Guatemala’s recent history through the actions and perspectives of the majority indigenous Mayan population, who now stand poised to change their society. After her own daughter’s near brush with death, Nely Baeza makes a tremendous personal sacrifice to discover that the water in her community is causing leukemia in the local children. In the spirit of Erin Brockovich, Nely reaches far beyond her means to summon the persistence and courage to stand up to forces far greater than herself. Liliana is wrestling with a borderline personality disorder. When two of Mexico’s best mental institutions are closed down, Liliana moves back into her community where she will fight to lead a normal life, supported by her parents and closest friends. Away from Meaning is a poetic and personal portrait which decidedly takes the stigma against mental health out of the shadows for proper care. An epic tragedy of corruption and betrayal, “Impeachment” is a behind-the-scenes look at the ousting of Brazil’s first female president. With exclusive access to the president and other key politicians, the film unravels like a political thriller as Brazil falls into disarray, echoing the undoing of so many democracies throughout the world. In the heart of the Amazon, large numbers of jaguars are being quietly decimated for the Chinese black market – and the world has no idea. Desperate for answers, a park ranger, a conservation geneticist, and a wildlife activist spark their own investigations and put themselves on the front lines against China’s insatiable demand. The real revolution in Colombia is to sit down and dialogue with an enemy rather than exchange bullets. “The Negotiators” tells the story of four years of peace talks in Havana, which ended a fifty two-year war. “The Pushouts” is the incredible life story of Dr. Victor Rios who - by 15 - was a dropout, gang member & heroin dealer in Oakland with multiple felonies and a death wish. “I was in prison before I was even born,” says Dr. Rios decades later as a tenured UC professor, an author of several books on the criminalization of youth of color and a national expert on one of the worst crises facing our nation today: the school-to-prison pipeline. With footage spanning 25 years documenting Rios’s own transformation - catalyzed by a Chicano mentor and nurtured by a persistent public high school teacher – “The Pushouts” provides a powerfully intimate and urgent vantage point facing America’s “at risk” youth. “Unaccompanied Children” reveals America’s invisible refugee crisis through the eyes of one family that defies a broken system with their unwavering resilience. Deep in the everyday life of the loving and optimistic Gonzalez family, the horrific past of gang-ridden Honduras and the encroaching threat of draconian U.S. enforcement are almost forgotten. The film goes beyond the traditional immigration narrative to a nuanced, intimate story which implicates us all in how we care for the most vulnerable.